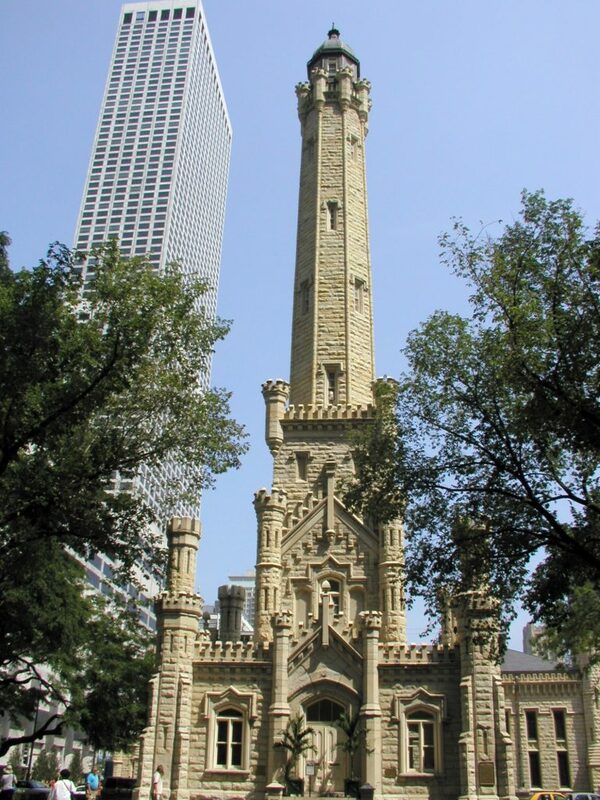 Chicago Water Tower is one of the most popular historic attractions located near the Gold Coast. Just a few minutes walk from the Walton Residence, visitors can stroll along the Magnificent Mile to the gorgeous 19th century landmark. The limestone tower is located directly across the street from the Chicago Avenue Pumping Station and Water Tower Place, a shopping center named after the monument. The Chicago Water Tower was built in 1869 as a way to irrigate water to the neighborhoods that would eventually become the Gold Coast. Because the water closest to the lake shore was so polluted, a new channel system had to be built to access Lake Michigan. The building was designed by William Boyington and housed a 135 foot iron standpipe. The architecture is styled after the Gothic Revival movement of the 19th century. Many buildings resembling medieval castles emerged during this time period. Boyington also designed the first Chicago Board of Trade, but it was one of the many buildings that was destroyed in the Great Chicago Fire of 1871. According to Maurice Champagne from the Chicago Architecture Foundation, the Water Tower survived the fire because of a German immigrant named Frank Trautman. Trautman helped keep some buildings from catching fire by draping wet blankets and canvases over them. Though it did sustain heavy damage, the Water Tower remains one of the oldest buildings to survive the Great Chicago Fire. Due to its damaged state, the Chicago Water Tower was mostly forgotten about by the city. However, in 1913, attempts were made to preserve the old building when it was revealed that the tower would be demolished to make way for other construction projects. Thanks to the Chicago Historical Society, the building remained intact and it’s even reported to be the reason Michigan Avenue curves slightly east. Though disconnected from the water system in 1911, The Chicago Water Tower remains a popular Chicago landmark and is now used as a venue for local artists. The Chicago Water Tower draws millions of visitors from all around the world and stands as a symbol for a city determined to rise out of the ashes.